This is a traditional lighthouse designed by Thomas and David Stevenson. 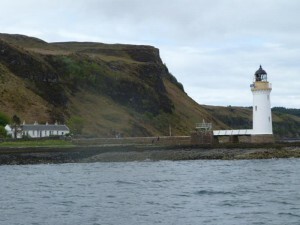 It was first established in 1857 and manned by keepers until 1960 when the light was automated. The tower is on a small islet joined to the keepers house and the shore by a bridge. The light is exhibited from a black-painted lantern room at the top of a 19 metre white-painted masonry tower. Access is by a one mile walk along the cliff top path from Tobermory.